It is great to travel it is even better to meet people in those places you visit and be able to have an exchange of common interests. 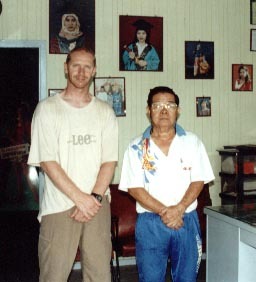 On a recent trip to Malaysia I was able to visit some Tai Chi practitioners, that my Tai Chi brother Jonathan Newman had met on an earlier visit. Though these people were unknown to me I had decided to make an effort to say hello and send Jonathans regards to a Mr Tam whom he had met before. So after an over night bus from Kuala Lumpur to Mersing on the south east coast, a bus that was very cool and not particularly comfortable, at four in the morning we arrived to an all but deserted bus station. It was a tiring journey with no chance of any rest however I knew that somewhere round there was a car park that played host to the Tai Chi people I had come to meet. Where exactly I was not sure but in two hours they would be there so all I had to do was find the car park. In such a small town this should not present a problem. After a little misdirection and confusion the car park turned out to be next to the bus station, so much for having to find it. By around 6:15am people had started to arrive and warm up for their training. I watched enthralled as a tape was played with someone counting from one to ten in Chinese again and again, dubbed over music. At first it seemed bizarre but it definitely had its good points. After the warm ups the group went through the Cheng Man Ching form and my partner and I decided it was time we did some training of our own. My partner began by doing the Pa Tuan Chin and followed by the Lam Short Form this generated great interest and some of the class stopped their own practice to watch the strangers going through their paces. At first this was somewhat distracting nonetheless we continued with our practice and our audience continued to grow. Once the class had finished I approached the man whom I had discerned was Mr Tam and spoke to him offering my greetings and Jonathans regards. 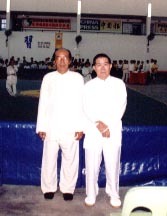 We spoke for a little while about Tai Chi Chuan and he asked me to show him the form that we practised, which I did happily. I was then asked to join in some push hands with Mr Tam. I readily agreed and we adjourned to a small grassy area. The contest proved very edifying for both of us and I then pushed hands with another person from the class. We all said our goodbyes after this and went our separate ways. Through this meeting I got to meet Mr Lock Siew Lam whom I assumed was Mr Tams Sifu, though I was never told this explicitly. As we were waiting in Mersing for a boat ride to an Island just off shore my partner and I decided to go and find somewhere to eat breakfast. On our ramble about the town we met a number of people who we had seen earlier doing Tai Chi Chuan, all of whom were very polite and friendly. It was just after breakfast that we met Mr Lock Siew Lam and he took us to his place of work where I met his boss. Mr Lock spoke very little English and my Chinese is poor so his boss translated for us, he complimented my Tai Chi Chuan and asked if I would be able to join in a Tai Chi competition which was occurring in November. Unfortunately this wasnt possible as this was September and I had to return to England to study in October. 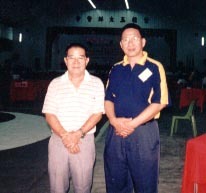 We soon after parted company but not before we had our photo taken together and I promised to send him a copy. From there we continued with our holiday; upon our return I wrote to Mr Lock with a copy of the photo. 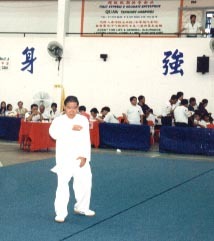 To my great surprise I received a letter back soon after with some photos of the Tai chi competition where Mr Lock, Mr Tam and two other members of the Mersing Tai Chi company had competed. The letter informed me that all had achieved a very respectable third place within various disciplines securing a bronze medal for each. 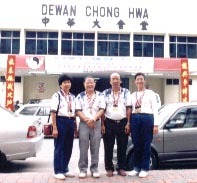 The pictures show Mr Lock and Mr Tam competing and following with Master Liew Chin Hoong and with all four members of the Mersing Tai Chi company with their medals. It has been a great pleasure to have met such pleasant people without the problems of ego, where adesire to learn, exchange ideas and train with all this in mind has led to a new friendship spanning culture and countries. I hope to see them all again sometime in the near future so should you find a similar situation on your travels, whether at home or abroad, I hope you too can find a way to span the divide and discover a fellowship of Tai Chi for yourself.